If you are arriving to Fort Lauderdale by sailboat or motoryacht, here are some tips to make your voyage a bit easier. However, this information is for general knowledge purposes only (in other words, "not for navigation). Prudent mariners should use a current nautical chart and consult the local marine authorities if they have questions or need assistance on the water. Arriving from Offshore: Entrance into the channel at Port Everglades is pretty straightforward, as you can see from the photo above and your chart. There is a large turning basin right inside the channel at the Port. To the north of the turning basin and port you will encounter your first drawbridge (17th St Causeway bridge), which spans the Intracoastal Waterway. It has a 55' clearance when closed. As with all bridges on the Intracoastal Waterway in Ft. Lauderdale, the bridge tenders monitor CHANNEL 9 for requests for bridge openings. There is a strong current under the 17th St. Causeway bridge, therefore exercise caution especially during an outgoing tide. Continuing north along the ICW in Fort Lauderdale, past the 17th St. Causeway bridge, follow the channel markers (and consult your chart) and you will see the confluence of the New River with the ICW. This westerly route takes you into the heart of Ft. Lauderdale up the New River with many large waterfront homes, restaurants and marine businesses lining its banks. Anchoring in Ft. Lauderdale: First and foremost, there is a 24 hour anchoring limit, which means that you can only anchor for 24 hours within city limits. 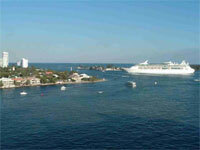 There are two known anchorages in Ft. Lauderdale. The "free" anchorage is at Lake Sylvia, which can be accessed from the ICW (consult for exact location and approach). Lake Sylvia is a large circular basin surrounded by large waterfront homes. No dinghy facilities or places to come ashore are nearby. The nearest places to bring a dinghy or tender to are a few waterfront restaurants near the mouth of the entrance to Lake Sylvia, but they are not free and will expect you to eat or drink there and you can't leave your dinghy there. Lake Sylvia is well protected though, so if the weather is nasty you can drop an anchor there and rest for a while. There is a sandbar in the middle of the entrance to the lake, so you must hug the eastern side of the channel to stay in deep water. Once inside the lake there is more depth. The city mooring field is on the south end of the Las Olas Bridge and features 10 mooring balls at $20 a night. You can hail the Las Olas Marina on the VHF Channel 16, or call them at 954-828-7200. The moorings are available on a first come, first served basis. If you take a mooring you must dinghy over to the marina to fill out the paperwork. There is a dinghy dock there, as well as comfort facilities. If there is no mooring available when you arrive, you may anchor on the outside of the mooring field overnight but you must pull anchor by noon the next day. The dinghy dock is only available during the business hours of the Las Olas Marina, which are 8 am to 4:45 pm. If you arrive during bad weather and have to choose between the city mooring field and Lake Sylvia, the latter is much more protected from the elements and traffic from other boats. Getting around Ft. Lauderdale: Fort Lauderdale is graced by a unique and wonderful water taxi and bus service, with many convenient stops. This is definitely the way to go if you want to get around town to run errands or if you just want to see the sights if you are in town. Most water taxi operators entertain riders by pointing out historical or cultural spots along the waterway, making it seem almost like a narrated tour at times. Best of all an all-day pass costs only $5. The water taxi also connects with several bus lines if you need to travel to an area that is not near the water, such as the largest West Marine on the east coast.